What if you could have your coffee always ready, at the simple touch of a button and always in one minute or less? This is exactly what you get with a Keurig. Specifically, the K45 which is equipped to make tea, coffee, hot chocolate and all up to 500 varieties at the single press of a button. Maybe you want something like this for your office or workplace, so that a hundred different little foibles can be catered for and at speed. Or, maybe you just fancy the convenience of never having to mess about doing the donkey work, of grinding, putting in filters and just want a coffee, quick. Fair enough! Looking smart and functional rather than some kind of requiem for the eyes, this is a utilitarian coffee maker that does what it says on the tin and will impress you with its speed and convenience, rather than its shiny steel or comely curves. So, the all important question for any coffee lover asking about the Keurig K45 Review is, does the coffee taste any good? Well, of course, this all depends upon whom you are asking. Our research has shown a whole lot of 5-star reviews flooding in all the time for this product, and once you try it, we think you’ll see why. Things that Keurig K45 customers enjoy most about the coffee from their machine, is, overall, its freshness. Pop in a pod and in no time you’ll be drinking a fresh cup of your favorite-flavored coffee. Also, you’ll love having the choice of literally hundreds of varieties of bean and strengths of coffee. It’s like a coffee buffet in your kitchen or office, and you’ve got a free pass. For singletons, light coffee drinkers, or households where everyone wants something different (and quickly!) the Keurig K45 Elite Brewing System is a godsend. The only criticism that seems to exist for these K cups is that there almost is too MUCH choice. Also, you can do a lot more than coffee – this also produces great teas, chocolates, cocoa and other hot drinks. In fact it does not even stop at warm beverages. You can also do iced drinks in it. Certainly, no one could ever complain about the variety that the K45 offers to the user. Nor the speed, with every single drink taking a mere sixty seconds from button press to steaming beverage. There is certainly a lot to commend this machine and if you have a spare $100, you could do a lot worse than avail yourself of this little beauty. Of course, not everyone is quite so enamoured of this single cup maker. The main concerns are around the price. There is no getting away from the fact that K Cups are expensive. If you buy this machine, you need to accept that you will always be shelling out for pods and it will not be the bargain basement experience you may be wishing for. If financial considerations are going to be a restraint, it may be worth a think about whether this is the right machine for you. 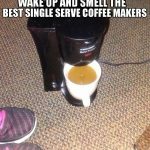 However, there are things you can do to save money, there are re-fillables available and some enterprising souls have found ways to effectively “cheat” the machine by customizing their K cups with cheaper brands. These may prove a bit of a hassle and ultimately slightly against the spirit of a machine that is simple, quick, un-fussy and easy to use, but it is definitely an option for those who feel money needs to be saved. Other complaints can be viewed slightly more objectively. So, the strength of the coffee cannot be selected with a pod system. This seems a bit of an unfair criticism. 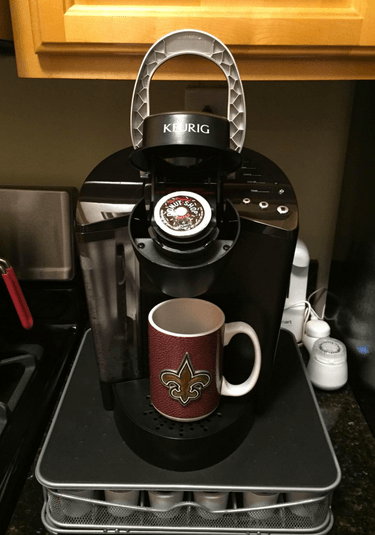 If you buy a machine like the Keurig K45, you simply accept that is how it works. If you wish to select the strength of your coffee, you really want a traditional coffee maker, which gives you more options in terms of how things are done. Also, with so many pods available it seems a bit unlikely there really wouldn’t be one out there suitable for all tastes. It is true, that for some, the disposable nature of this machine and the constant needs for pods and all the packaging that goes with it produces a lot of waste. If this is an issue for you, then this may be a consideration. Overall, this is a great and versatile machine that offers a fantastic range of hot drinks, including but not exclusively, coffee. You will certainly never be bored if you opt for this machine. Also, you will have the speed and ease of coffee more or less on demand with each cup fresh every time. However, they are not cheap to run. You cannot make huge vats of coffee with this and you will not be testing your barista skills out anytime soon either! 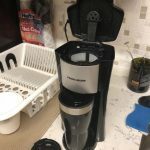 Ultimately this reviewer feels that this is an excellent choice for someone who either does not drink a lot of coffee, or lives with people who like completely different types of drink from them. It is also excellent for a workplace or community center/ area where lots of people are congregating and all want something different. – 4 STARS! K-Cups Vs. Coffee Pods - What's the Difference?